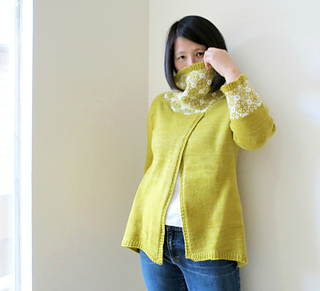 Pullover worked from top-down with 2-color stranded colorwork for neck and cuffs. Hi-Low hem adds to the gentle A-line silhouette. Sizes are based on chest measurement of finished garment in inches. 1 to 5” / 2.5 to 13 cm positive ease is recommended. 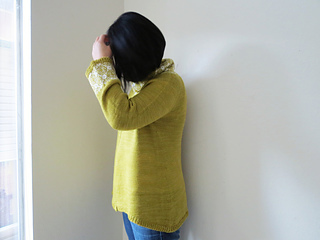 Sweater is modeled with 3” / 8 cm positive ease. Slight A-line shaping from underarm to hem. Colorwork on neck and cuffs.